Game day is almost here!! 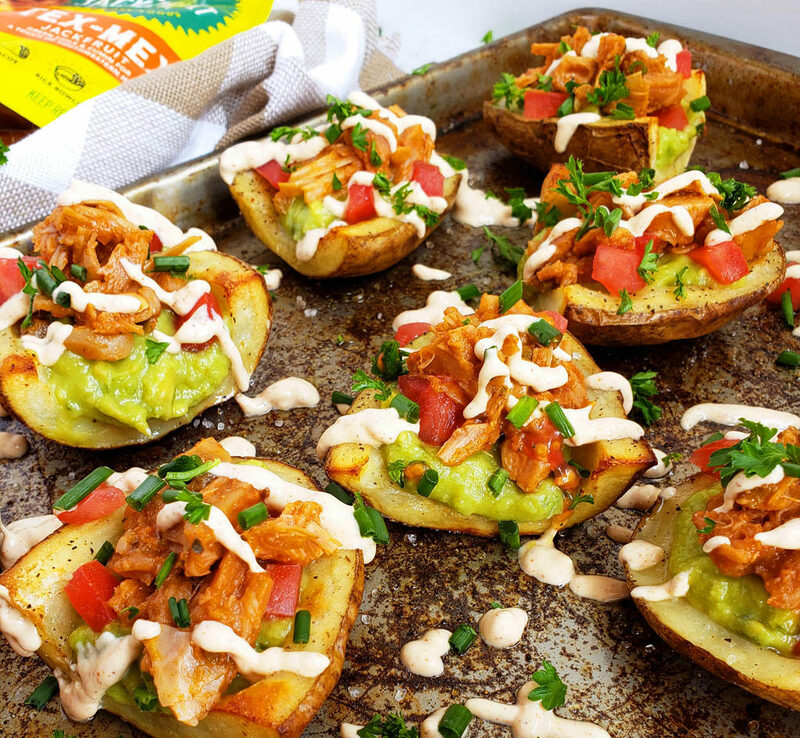 Impress your guests with these Vegan Tex-Mex Loaded Potato Skins! This post has been sponsored by The Jackfruit Company. As always, all thoughts and opinions are my own! Where are all of my football fans?? I don’t know about you, but I get more excited for the football food than the actual game! I love to get together with our friends and eat, drink, and just have a great time! As good as that sounds, I wanted to make this appetizer a little bit healthier and vegan-friendly! We have a lot of friends that are vegan so I wanted to make something that they could enjoy too! 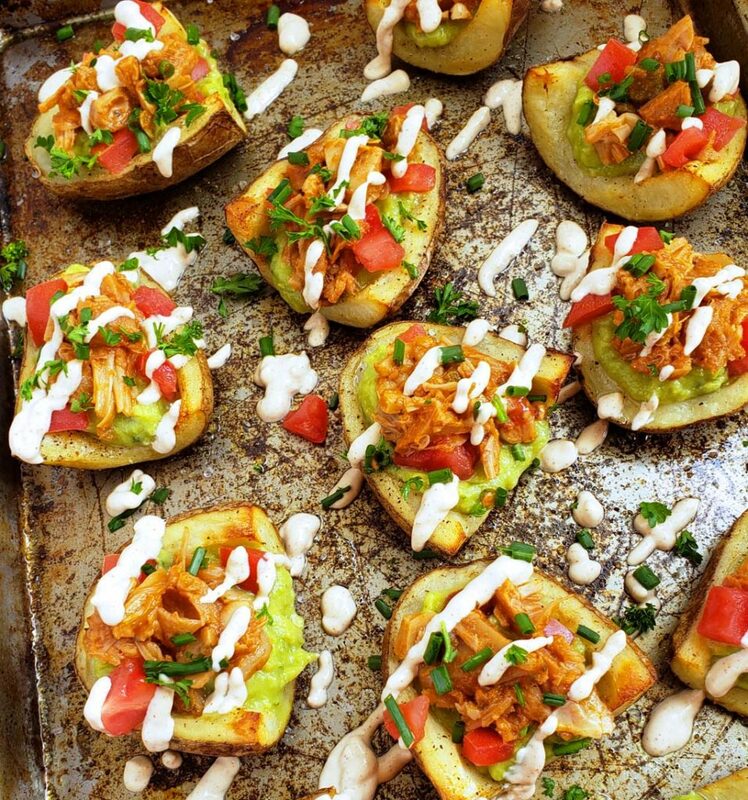 I decided to make these Vegan Tex-Mex Loaded Potato Skins, featuring jackfruit! Jackfruit has a subtle sweet and fruity flavor. Vegans and vegetarians often use this fruit as a meat substitute due to its texture, which is comparable to shredded meat. If you’ve never tried jackfruit before then you’re definitely missing out! Jackfruit has so many wonderful health benefits, including a great source of fiber! 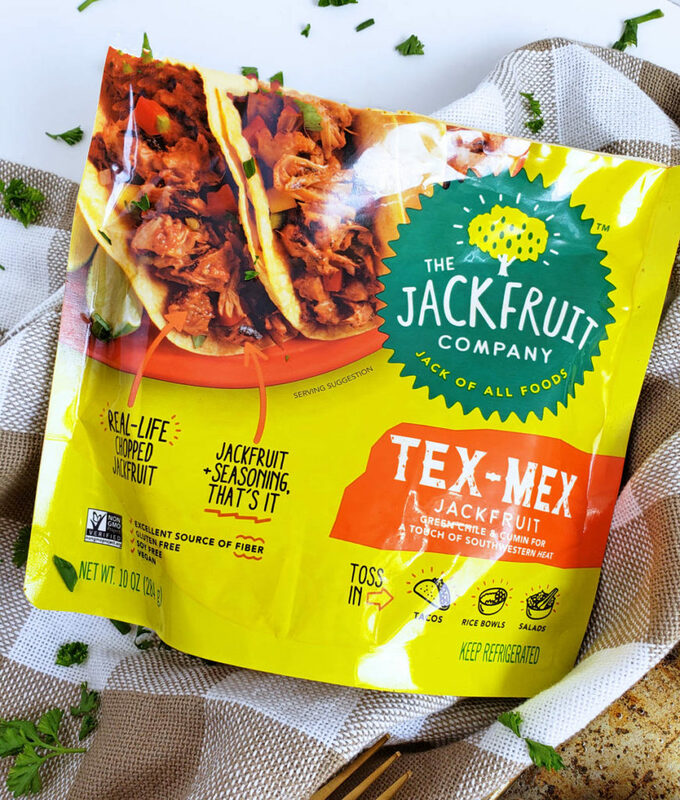 The Jackfruit Company carries several yummy, savory flavors that are conveniently packaged and located in the refrigerated section of most grocery stores, like Whole Foods! Jackfruit contains 3 grams of fiber which is essential to a healthy daily diet. Most Americans do not meet their daily requirement of fiber, so adding jackfruit to your diet regimen would definitely help. Jackfruit contains a moderate amount of calories, and a great source of vitamins and minerals. I have tried jackfruit in sweet recipes such as smoothies, but I was curious to try it in a savory recipe! 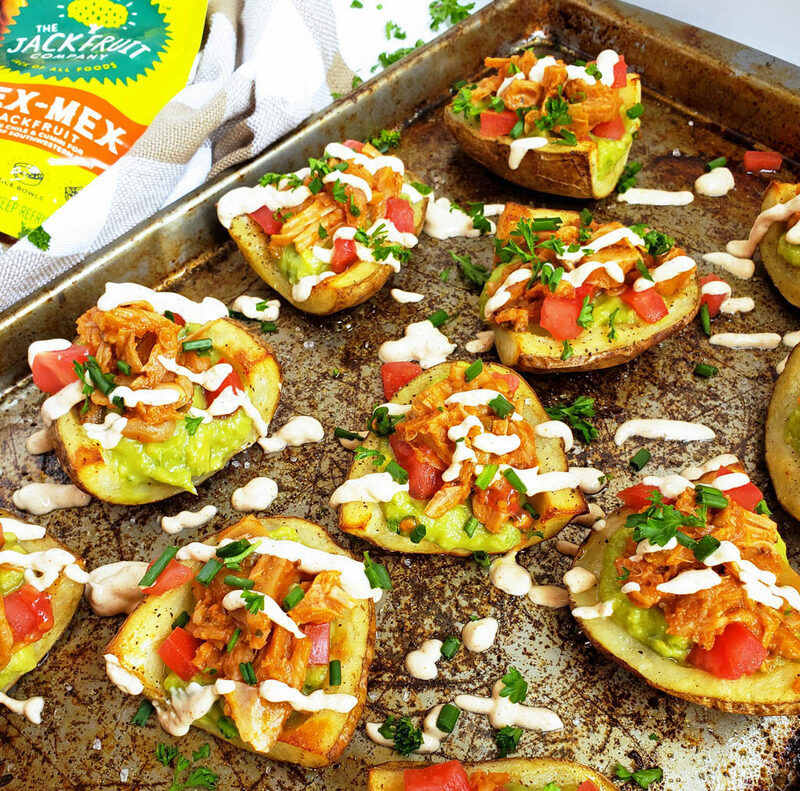 The Jackfruit Company Tex-Mex flavor was the perfect addition to these Vegan Tex-Mex Loaded Potato Skins! It was very easy to prepare! I warmed it in the microwave and topped my potato skins with a hefty serving! For the finishing touch, I drizzled a little Vegan Ranch Dressing on top! 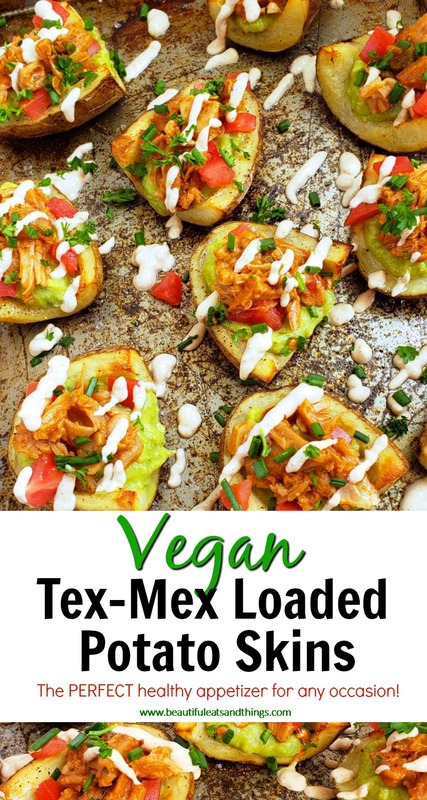 These Vegan Tex-Mex Loaded Potato Skins were so AWESOME, but there was one problem…I didn’t make nearly enough!! My family completely devoured them! On game day, I guess I will have to triple this recipe!! For more information about The Jackfruit Company, click HERE! Cut potatoes in half lengthwise, and then in half. Scoop out pulp, leaving a 1/4-inch shell. 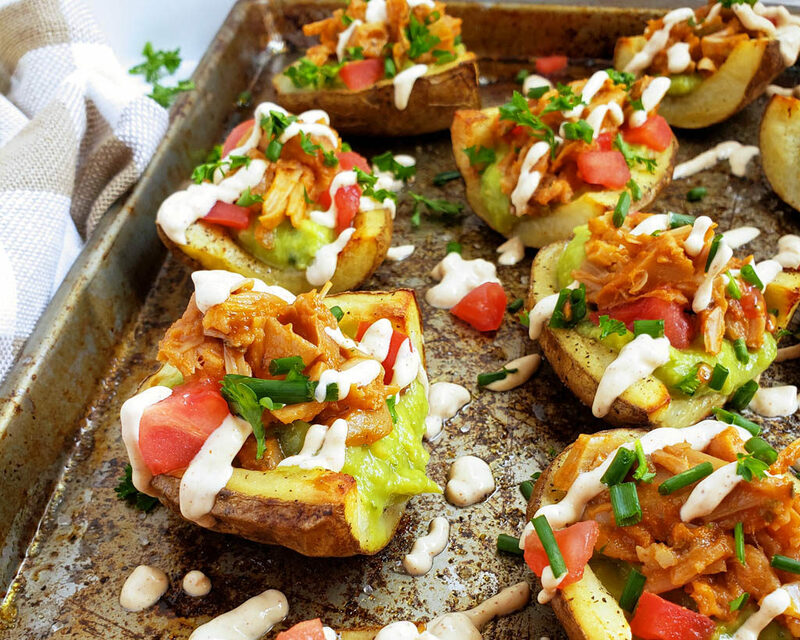 Place potato skins on a greased baking sheet. Drizzle with oil and season with salt and pepper. Bake for about 25-30 minutes. When skins are done, let cool for about 5 minutes. 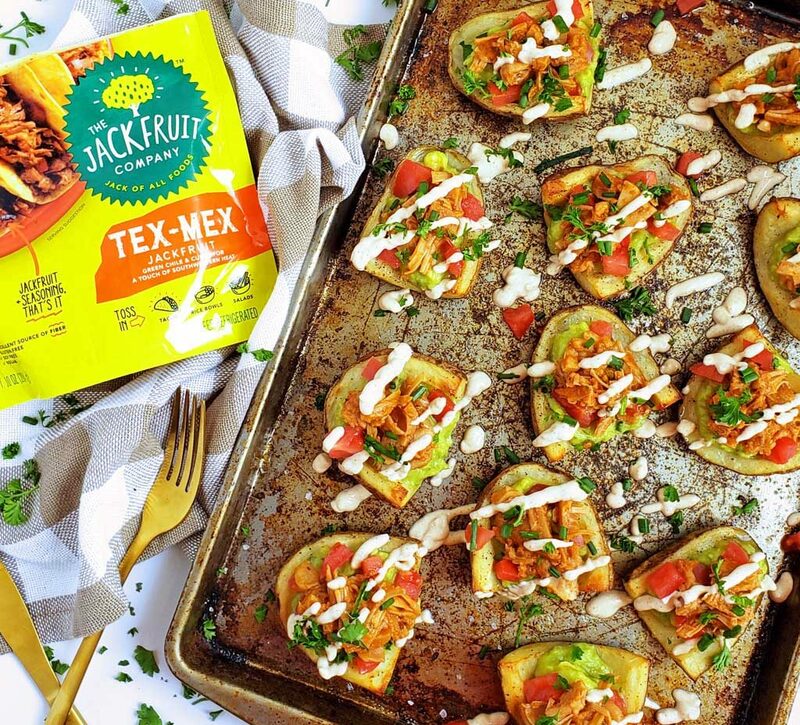 Warm The Jackfruit Company, Tex-Mex Jackfruit per package instructions and set aside. 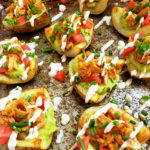 Top each potato skin with a tablespoon of guacamole, diced tomatoes, and a tablespoon of The Jackfruit Company, Tex-Mex Jackfruit. 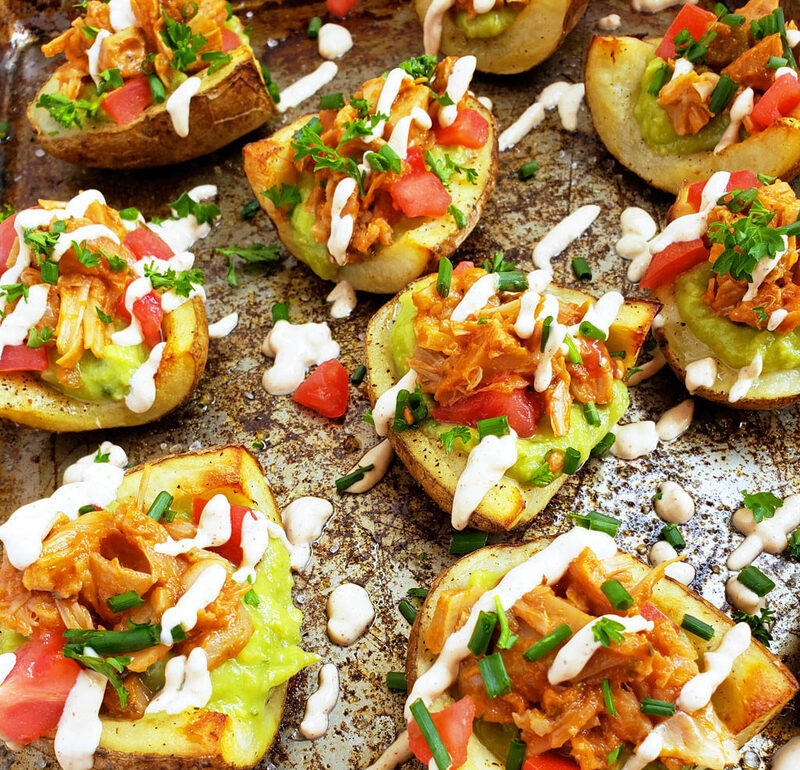 Sprinkle chives on top of potato skins and drizzle with your favorite vegan ranch dressing.